You can resonate right off the text of the day, or just use the Creative Focus of each day as a spring board for some kind of an artist endeavor. You can use the guide to keep a personal Advent journal, fill a 25 page sketch book, or inspire us all with cool Facebook posts. It’s yours to enjoy and put to use however you choose. The devotions will cover every day of December right through Christmas Day! My prayer is that your Advent and Christmas celebrations are rich with all the best blessings of Life: God’s presence, fun times with family, deep prayer, lots of rest and delicious food! May your body and soul be filled by the best! 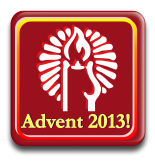 This entry was posted in Advent, Devotional Thoughts, Making Art and tagged Advent, Creativity, Devotions, Making Art.